Pee-youuu!!!!! New York City stinks! I *heart* NY…I really do. But, despite being an amazing place, this city is plagued with crowds, crime, and most of all, dirt. And with all of the people and filth, things can get pretty smelly. The source of the smell had been a mystery since 2005. During the hot summer of 2009, the New York Times published Op-Art piece, “Scents and the City” that details writer/artist Jason Logan‘s experience “navigate[ing] the city by nose.” So, clearly I’m not alone in wondering what’s up with all the funky smells! Check the odor map out here to see if you have gotten a whiff of the same smells. The most common smells I come across include: urine, dog poop, fish, kebabs, hot dogs, pizza, falafel, perfume, burning rubber, marijuana, vomit, road kill, hair spray, nail polish, bagels, paper, donuts, flowers, cigarette smoke, onions, hot metal, must, incense, soap, grass, horses, curry, diesel, dumpsters/trash, lip gloss, coffee, candles, wood…It’s like a smorgasbord of funk! 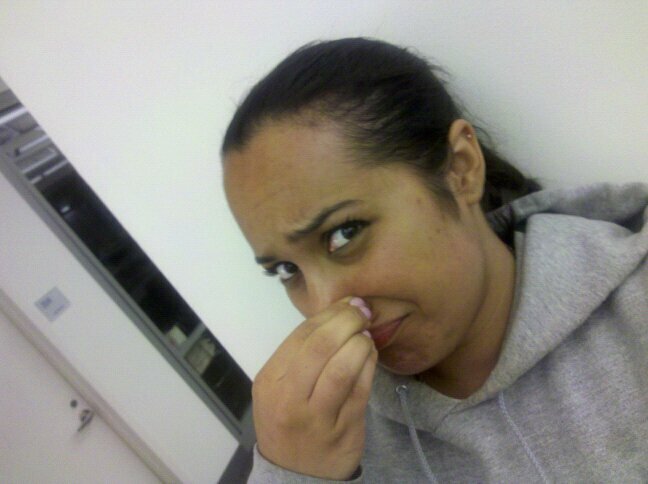 While some smells are tolerable on their own, when combined, they can be rather nauseating. What do you think is NYC’s worst smell? Where do you smell it? This entry was posted in Ask a Question and tagged funky, great maple syrup mystery, hot, New York City, odor, pests, smelly, stinky, subway. Bookmark the permalink. 1 Response to Eww! What’s that smell? Amy, this is hilarious and sadly, all too true. For me, it is this one corner (brighton beach ave and brighton 1st rd) that always, always reeks. It is a cross between really bad breath, diapers and rotten fruit. We suspect it has something to do with the storm drains.